Who doesn't love to laugh?! Whether you are all giggles during a game night with family and friends or cracking yourself up over the hilarious prank you pulled on your best friend, smiling is totally contagious! 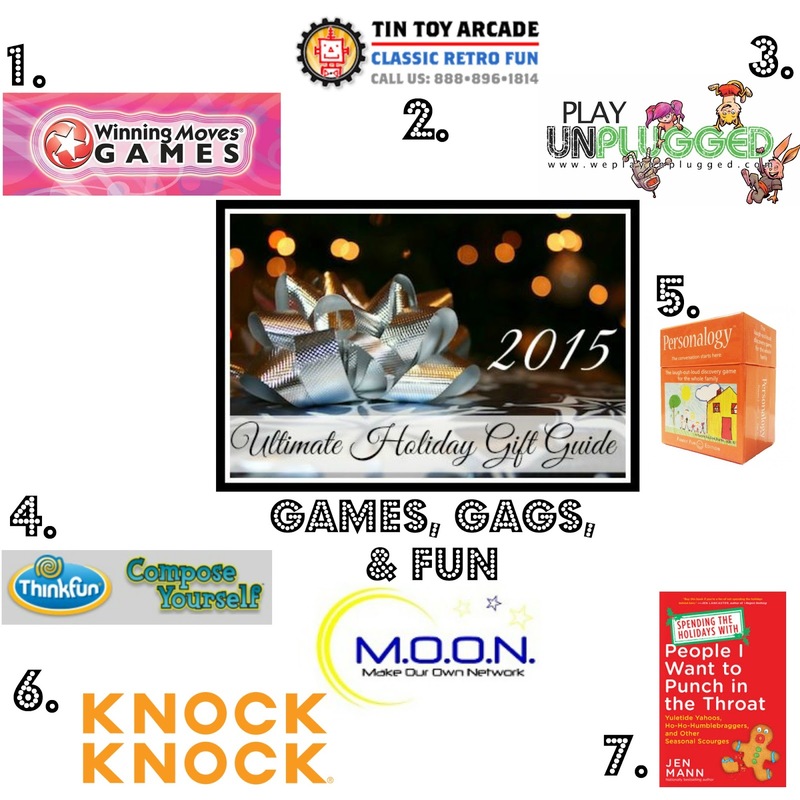 I've got some really great products for family game nights, the pranksters and even some adult games (at the bottom) to get every age having fun this holiday! I love having one place which I can find all the games and favorite past times my family wants. There are classic games available that I had even forgotten about! 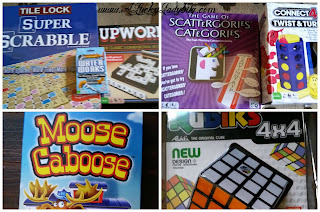 You can find your little ones new games such as Moose Caboose; Celebrate a long time tradition with the Rubik's Cube; Scoop up a classic game like Water Works or Upwords; Or take on a new challenge with a different version of an old game with Connect 4 Twist and Turn or Super Scrabble Tile Lock. TinToyArcade is a Family Run toy shop managed by friends and family which provides classic and old fashioned toys with their traditional designs and values. Whether you are looking for a toy you remember from your past as a gift to someone you shared those memories with or a toy to share the same love with your children, this is the place to find a selection you won't see anywhere else. The Change A Tune Piano is a classic which even your littlest one will love to play away on. Playing “Pop Goes the Weasel," “This Old Man,” and “The Muffin Man”, it will strike a cord in you just as much while watching them play! The Draughts or Checkers Board Game 1890 reminds me of late nights with my grandfather playing at the kitchen table as a child. Scooping up a game like this gives anyone the nostalgic glitter in their eye as they play with new family members. If you are looking for a new take on a classic game, there are always games like the Travel Memory Game Wood Deluxe Set which can be shared with little ones for any road trip. Started by a child's curiosity after discovering similar toys, Tin Toy Arcade has thought of every memorable moment of past time fun. With a store that has such a variety of products you just can't find anywhere else, it is hard to go wrong. You are likely to spend hours shopping and can probably eliminate most people on your Christmas list in one place! Technology has become a huge part of most children's lives today. While I love the opportunities my children have that I might not have had growing up because of technology, it has hindered today's youth when it comes to keeping active. Children need to know how important fitness is in living a long, satisfying life! Play Unplugged Home realizes this and has created an easy at home incentive program for families. Every parent really needs to learn how to get your kids to put down the video games. Your children can earn rewards called Brag Badges for completing offline active play and other activities. The idea of offline, outdoor fun is quickly disappearing and part of keeping our children happy, healthy, and always learning, is taking a break from the online world. Each Brag Badge has a certain 'brag value' or point value to them based on the difficulty of the activity. They are separated into four categories: Active Life (red bottom packet), Outdoors (beige bottom packet), Creative Fun (blue bottom packet) and Around The House (green bottom packet). Parents are able to set goals or "prizes" for their kids to work towards (ie. toys, games, trip/activities, etc). In the very short time we've had our set, the boys have spent more time offline having real fun together as they work towards the goals I've set for the prizes they really want. I love seeing them excited about getting offline instead of it being a chore or getting upset when Mom says turn it off (which in fact I don't have to do anymore). I literally spent a few moments explaining the concept to the kids, setting the goals, and the rest is up to them. If I want to be involved I can, if not they love doing the activities on their own without me having to give them ideas of what to do outside and around the house. 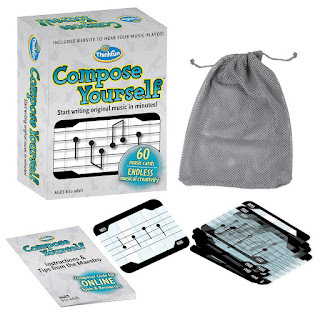 What's truly awesome is you can purchase the entire set, just purchase whichever of the four modules you want to do, OR you can just pick-and-choose which ones appeal to you and your kids. Help your children avoid their screen addictions! It is so important to get involved in your children's education and make learning such an exciting experience at any age. Games which kids might enjoy where they can learn while they are playing and not even realize it are a great way to get involved in the fun. ThinkFun is definitely a brand that helps you incorporate education while playing board games! 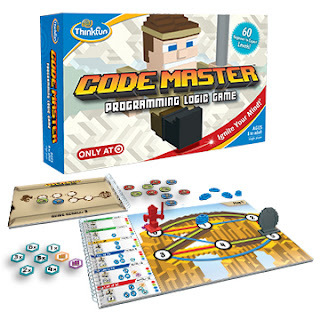 Code Master™ is a programming logic game in which children will use coding to try to get their avatar to the portal with the most amount of crystals. This is a game designed to help teach children the simple parts of coding. As an engineer myself, I believe this game helps children with a variety of skills and can lead to an easier experience in the coding world. Another game from ThinkFun, Compose Yourself made the cover of the Wall Street Journal recently. Children can learn to compose music on their own. With over 1 billion melodies, children can hear their composition pieces played by a full symphony Orchestra. What a creative way to embrace a child's musical talent! I love that each of their games is listed including the specific learning skills a child can gain from playing them. You can also search based on those skills, types of games, or by age. There is a large variety of games for each skill level and each child's specific interests! Have fun educating your children at home! "Ideal for ages 7+, players predict the card-holder’s answer and why. The deck contains 123 entertaining, silly, memorable questions and even more surprising answers. It comes with 101 kid friendly questions (many created by kids) 22 adult questions and 2 Grand Poo Bear cards (GPB)." Whether your stuck on a plane, long road trip, or sitting through another holiday get-together, this compact game is going to be your go to game to get the fun started! Gather the family together and get to know each other just a little bit more! Here is a game that will have everyone talking no matter how well they know each other. 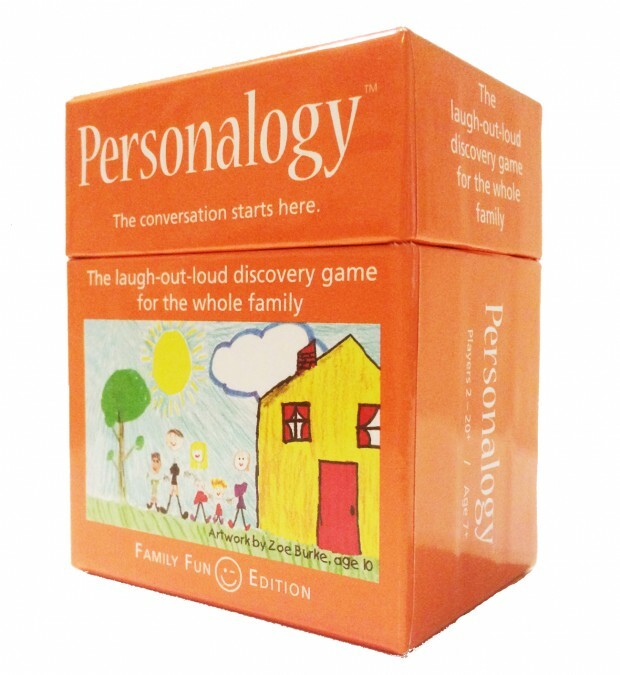 Enjoy conversations filled with laughs around the dinner table or on your holiday road trips this Christmas. So far my children cannot get enough of this game and have asked to bring it to Grandma's for Thanksgiving Dinner to get everyone playing something new! Knock Knock Stuff "products aspire to bring humor, function, organization, and aesthetics to everyday life. We believe that people are intelligent enough to appreciate wit, wordplay, and conceptual thought." With a variety of gifts to choose from, you might find yourself shopping for yourself in the end. 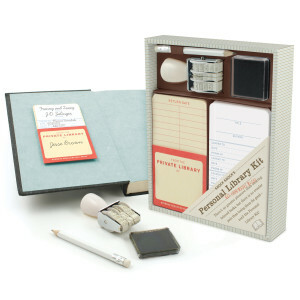 There is a variety of books, desk accessories like notebooks or sticky notes, and even photo albums. Here is your opportunity to buy that co-worker a gift which says the something witty you've been thinking all year. Any college student will love their stocking stuffed with a simple gift like 100 Reasons to Panic™ about Being a Grownup. Do you have a friend who is always borrowing your books or movies? Perhaps you're that friend! 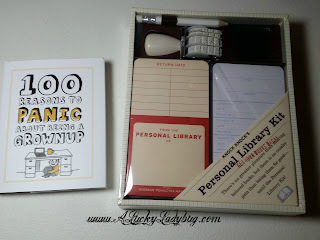 Scoop up the Personal Library Kit to keep track of those "things" you are lending out. Originally I discovered Knock Knock Stuff when looking for excited gifts for my college students dorm, but ended up finding a bunch of items for our own home. With our sense of humor, these products are going to make great gifts for any occasion and every individual personality. Enter Coupon Code 'LADYBUG20' for 20% off any order- Expires 11/24/15 and cannot be combined with any other discounts. 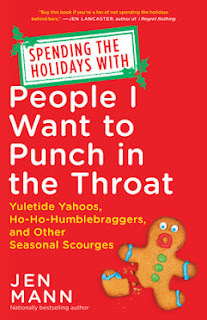 "When it comes to time-honored holiday traditions, Jen Mann pulls no punches...In this hilariously irreverent collection of essays, Jen Mann, nationally bestselling author of People I Want to Punch in the Throat, turns her mordant wit on the holidays. On Mann’s naughty list: mothers who go way overboard with their Elf on the Shelf, overzealous carolers who can’t take a hint, and people who write their Christmas cards in the third person (“Joyce is enjoying Bunko. Yeah, Joyce, we know you wrote this letter.”). And on her nice list . . . well, she’s working on that one. Here, no celebration is off-limits." Oh, the Winning Moves Games are great! In fact, I bought my nephew a Rubik's Cube this year so he can know the frustration I knew as a kid, lol. 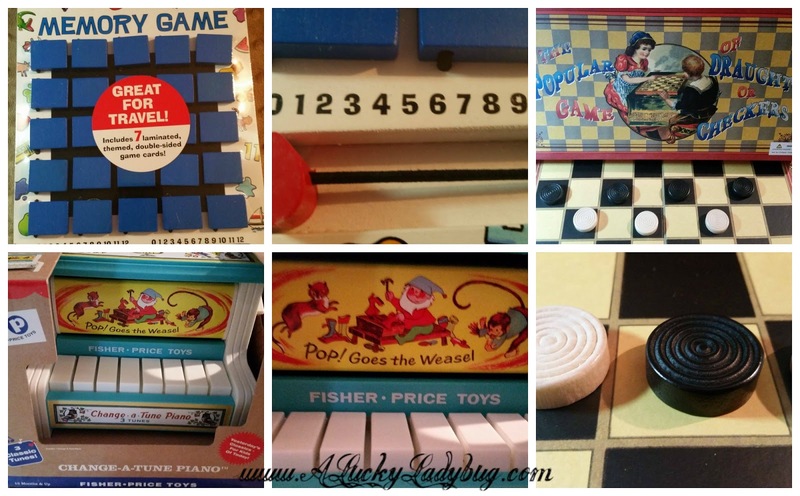 I do remember toys like the Tin Toy arcade has from my childhood! Those bring back memories. All of these look like great games! I've heard so many goof things about Winning Moves this year! Lol, People I Want To Punch In The Throat sounds pretty entertaining. I think we've all been there once or twice! I love Think Fun games because they make learning fun! 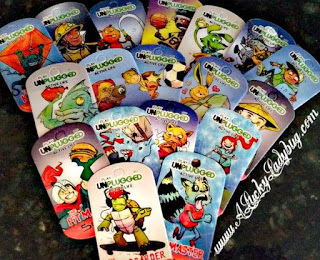 I think the Play Unplugged games look interesting. The idea of getting kidsplaying outdoors or getting creative is genius! My nephews & niece would enjoy that. 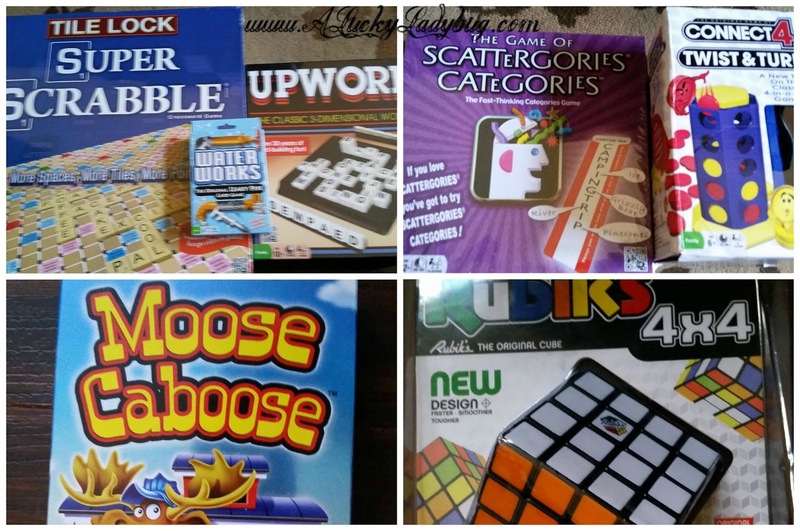 In our family, we all love to play board games and some of these I have never heard of but they sound fun to do. It is a great way to stay close to your grandchildren, I discovered this with my own kids who are now adults. Pay close attention to them and play board games is the ticket.